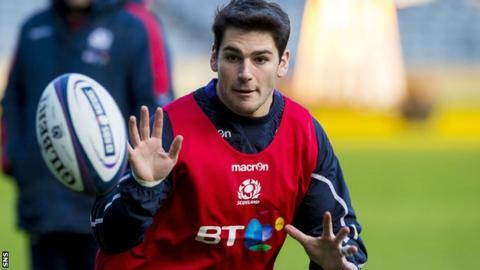 Scrum-half Sam Hidalgo-Clyne says "defeat is not an option" when Scotland open their Six Nations campaign against England a week on Saturday. The Edinburgh 22-year-old, likely to be on the bench, believes a good start is essential if the Scots are to build on their World Cup campaign. "If we can get one over England, that gives us a huge confidence booster and we are right there in the mix. "If we were to lose, that would obviously be a step back," he said. "For us, that is not really an option at the moment. We have not really thought about losing." Scotland have only won one of their last 12 Six Nations matches, have not beaten England since 2008 and not scored a try against them at Murrayfield since 2004. But the half-back, who has won eight caps since his debut in last year's championship, believes the squad are better prepared mentally under head coach Vern Cotter. "We have definitely developed as a squad and the mind-set had to change," he said. "Tournaments are physically and mentally draining and you have to get your mind-set right. "We need to start this tournament on a real high and go out with full confidence for this first game. "We are at home, we have got a brilliant squad, a very settled squad and England are not by any means, so there is no reason why we can't." Scotland may not have beaten England in their last eight attempts, but after taking Australia to the wire in last autumn's World Cup quarter-finals, Hidalgo-Clyne insists self-belief within the squad is strong. "One thing Scotland hasn't had much success with previously is believing in ourselves," he added. "But this is one of the most dangerous teams Scotland have had. There is huge confidence around the squad and we have to take that and believe in ourselves. "The tickets were sold out months ago, the fans are going to be right behind us and we are really looking forward to next week."